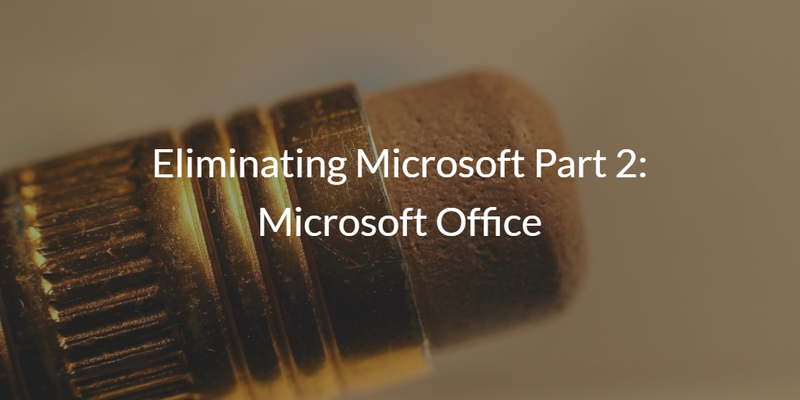 We’ll look at how IT organizations can move on from Microsoft Office in part 2 of our series on eliminating Microsoft from an organization. Over the past few decades, there’s been no shortage of approaches to solving the problem of being tied to Office. Unfortunately, none have really succeeded until recently. Even so, Microsoft is highly motivated to protect their Office franchise as it generates perhaps more profit than any of their other products. Microsoft Office has been the leading productivity solution on the planet since shortly after it released in 1990. The move to sell Office as a suite rather than as individual products (Word, Excel, PowerPoint, etc.) was nothing short of brilliant. Microsoft faced competition from a variety of different sources in each category. But by combining the solutions into one packaged solution, it put pressure on each individual competitor, which, in turn, gave end users the complete suite of solutions that they needed anyway. Most end users needed to write documents, create spreadsheets, and give presentations. The suite made a great deal of sense and quickly became a bestseller. While many solutions were being moved to the cloud, it was difficult to comprehend how a competitor could provide a solution that was deep and feature-rich enough to combat Office. A variety of different organizations tried, but generally the result was a weak competitor. Microsoft also used file formats to their advantage and the integration of the solutions together so that charts, pictures, content, and other items could be shared. It wasn’t until Google came out with Google Apps for Work that Microsoft faced its first formidable competitor. Unfortunately, it didn’t realize that GApps was competition until many years later. Google Apps didn’t take off with enterprises, it took off with startups. Those startups soon turned into larger companies. 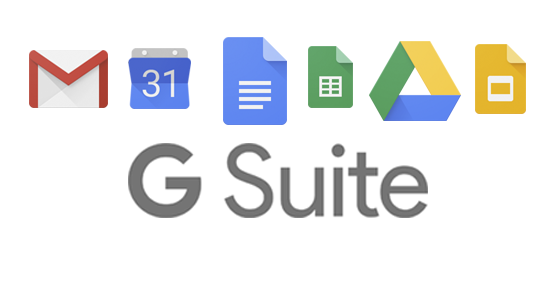 Educational institutions and nonprofits with less stringent demands and huge cost concerns started to switch to Google Apps as well. There was another benefit of this approach for these organizations. Since Google Apps for Work (now called G Suite) was accessed and managed by a web browser, IT organizations didn’t need to worry about the installation and management process with each person’s device. In fact, many of the end users would bring their own devices to work. And, of course, the device was owned by the student in schools and universities. G Suite has been a perfect choice for these organizations and soon posed a serious threat to Microsoft’s dominance in the productivity software realm. Microsoft’s first foray into combating the threat of G Suite was to create web versions of their product. The early approach was telegraphed by Outlook Web Access and their approach to email. Over time, though, Microsoft did get it figured out and released Office 365. O365 has a different focus. The goal of the solution is to make sure that end users leverage each application regardless of the platform or venue (on a person’s device, in the cloud, or on mobile). Microsoft has made tremendous progress is beating back Google’s significant advance into the productivity application space. Even with O365, though, IT admins have a viable option in G Suite. Over five million businesses have moved to GApps. And there are many more coming online each day. Many organizations are leveraging G Suite for most of their users. What about the select few that need Office? They are signing those users up for O365. For most users and organizations, G Suite is an ideal solution for their office suite and it doesn’t make sense to purchase Office 365 licenses for all users. As discussed in other parts of this series, a critical issue that IT admins face is how to manage their non-Windows resources. With G Suite, there is no central directory service to manage user access to resources like legacy apps, on-prem and cloud servers, and WiFi networks. 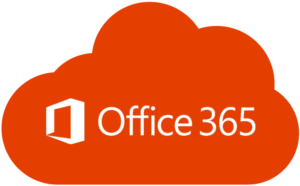 Office 365 also falls short as a standalone directory. The good news is that in both cases, a third-party, independent platform called Directory-as-a-Service® is an ideal replacement to Active Directory and a valid approach to managing G Suite or Office 365. Directory-as-a-Service provides you with the option to completely eliminate the Microsoft ecosystem from your IT environment, if that is a path you wish to take. Our cloud based directory provides you a streamlined management system for non-Windows resources that easily integrates with existing G Suite user accounts. Once those Google accounts are imported into our directory, those identities can efficiently be provisioned or deprovisioned to a variety of other resources including Windows, Mac, and Linux systems, WiFi networks, printers, file servers, and apps. If you would like to learn more about how you can be eliminating Microsoft from your environment too, we’d love to hear from you. 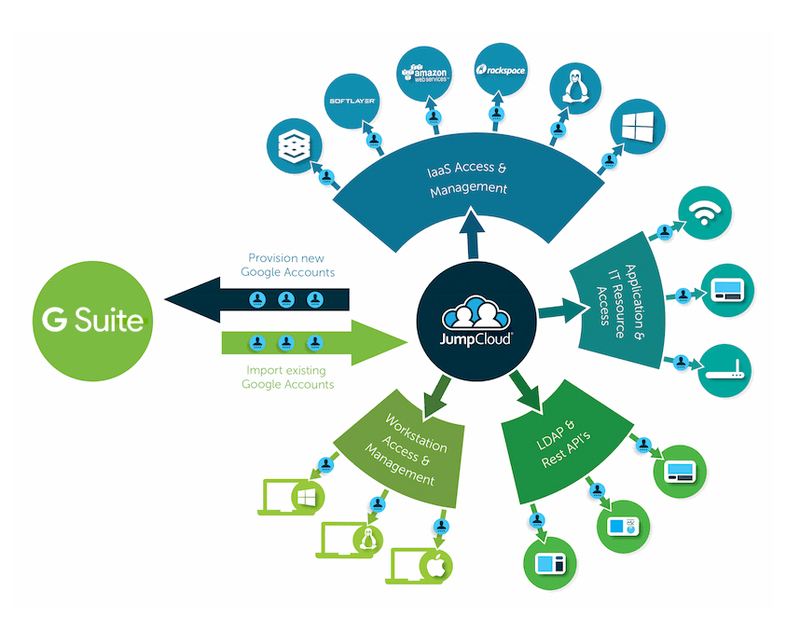 You can also watch this video that demonstrates JumpCloud’s directory-level integration with G Suite. Alternately, we invite you to start testing our cloud directory platform for yourself by signing up for a free account. Your first ten users are free forever.